Welcome to a new segment of DemandGen Radio called "MarTech Mondays"! In addition to our weekly episodes that feature top thought leaders and marketing practitioners, MarTech Mondays will spotlight some of the most innovative technologies in the space that you should know about. 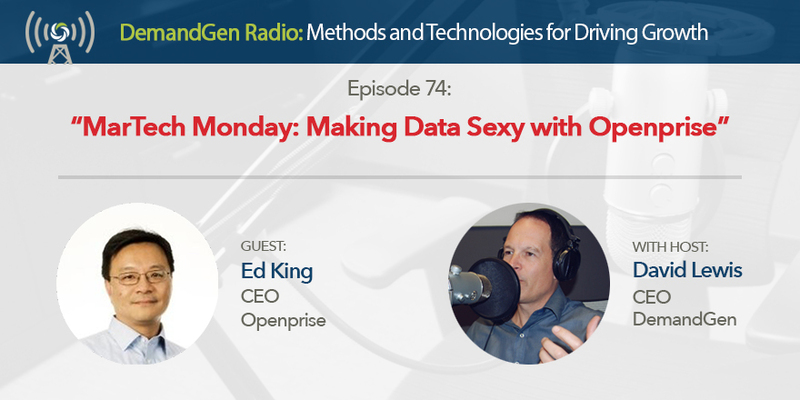 In this episode, Ed King of Openprise talks about the major data problems that exist in marketing today and why those problems are often neglected. While data management responsibilities now commonly fall under marketing operations teams, most marketers today lack necessary data management skills and find it difficult to tie data cleanliness to actual ROI. Fortunately, Openprise is helping marketers take an active approach to data management. Listen as Ed and I talk about the importance of data quality and how to address the biggest issues in data.